Review: A year ago, this Winnie-the-Pooh fan was excited to learn of two upcoming projects. One promised to go deeper into the life of the author A.A. Milne and the other from Walt Disney Studios would bring the famous bear and his friends to life in a live-action/CGI hybrid. Both films had serious potential considering the beloved material and high nostalgia factor. Well…fool me once (Goodbye Christopher Robin), shame on you. Fool me twice (Christopher Robin), shame on me. Whereas 2017’s Goodbye Christopher Robin was a manipulative mess of a biography, Christopher Robin is a dreary miss that clings too tightly to its wistful moments. The movie is constructed to have you biting your lip and furtively wiping away tears at very specific points but it tries too hard to get you to go that sad place. Maybe I’ve turned into a monster in my old age but I resisted and outright resented the way the film went about its business. Opening with young Christopher Robin attending a going-away party in the Hundred Acre Wood thrown by his animal friends, we learn he’s off to boarding school and will be leaving his friends far behind. Thus begins a rather long prologue where the lad becomes a man (Ewan McGregor, Beauty and the Beast) and eventually a war veteran. He’s now working for a luggage manufacturer with a wife (Hayley Atwell, Cinderella) and young daughter (Bronte Carmichael, Darkest Hour) he rarely spends time with. It’s a familiar sketch of a child that grows up and forgets what it’s like to conjure the kind of make believe fun that fueled a rich imagination. I mean, we all saw Hook, right? With his family away for a weekend, Christopher is supposed to be working through the logistics of making cost-saving budget cuts at his job when he meets up with Winnie-the-Pooh. Pooh can’t find his friends but found his way through a magic door that connects the Hundred Acre Wood to the outside world. Christopher follows Pooh back through the door and begins a sentimental journey through his past that connects him back to the likes of Tigger, Piglet, and Eeyore. Director Marc Forster has been hit or miss in my book for a while. I enjoyed World War Z, am slowly coming around to his James Bond entry Quantum of Solace, and last year’s All I See Is You was pretty underrated in my book. He’s had a diverse range of tones/genres which I respect but there’s this curious heaviness he adds to Christopher Robin that feels wrong. Even though it makes a last ditch effort to zing up the action in the last 20 minutes, the majority of the movie is too somber for young children and far too slow for older kids. Adults are advised to bring a pillow. The marginal good news is the period film looks amazing and the characters (much closer in design to Milne’s vision) are brought to impressive life through CGI. Whatever crazy subliminal product messages Disney put in the film worked because I left wanting to get a set of the updated Pooh and co. for my very own. The action blends seamlessly with the live actors and McGregor gets a gold star for making me believe he’s interacting with a stuffed bear. The film doesn’t try to hide the fact these animals can talk, nicely avoiding at least one tired plot device hurdle of stories such as this. 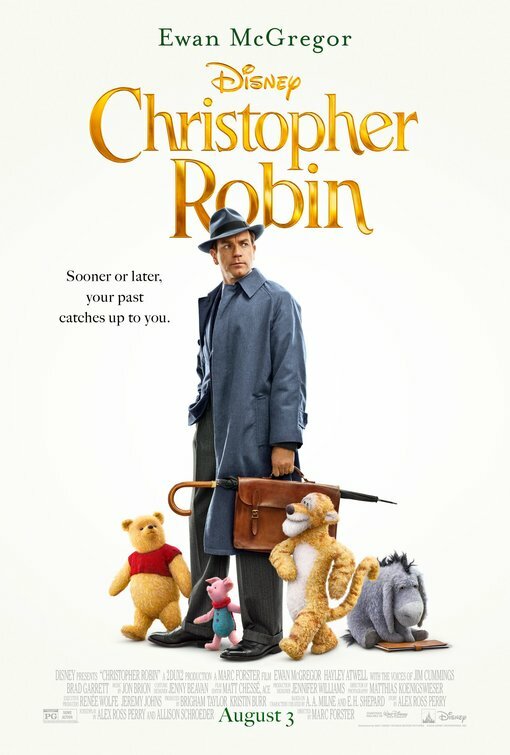 With bits and pieces culled from better movies about growing up too soon (add Peter Pan and Mary Poppins to the list while you’re at it), Christopher Robin is a disappointing entry in Disney’s attempt at giving its characters a live-action treatment. The film scores high in production value and is often saved by its CGI creations but it’s too tangled in its gloomy plot and obvious attempts at wringing tears out of you to be more than a summer bummer misfire. 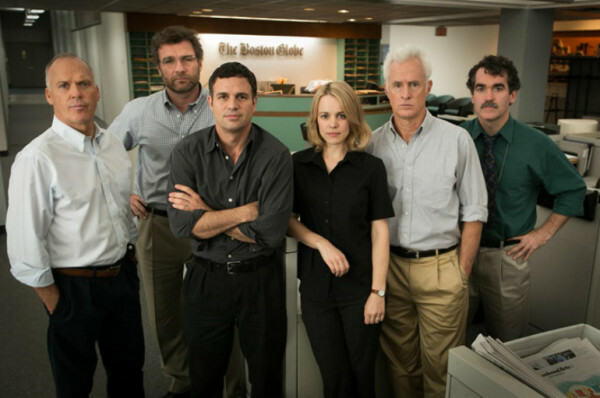 Review: More than anything, Spotlight reminds us what true journalism used to look like. In this day and age of up to the minute coverage that often relies on conjecture, I think we as a public have forgotten what it meant to do your homework, cite your sources, and deliver honest news. Sensationalism may have sold more papers but it wasn’t the driving force behind most true-blue journalists. That’s the overall message I took away from writer/director Tom McCarthy’s slow burn look into the investigative unit of the Boston Globe (the Spotlight team) that first uncovered the molestation scandal within the Boston Archdiocese. Setting into motion a global outcry for justice, the members of the squad took their time in gathering information, pounding the pavement, asking the tough questions, and documenting the horrifying answers. Drawing justified comparisons to All the President’s Men and filled with several genuinely troubling passages where shocking admissions of guilt are made as off the cuff remakrs, there’s nothing salacious on display. If anything, audiences may start to pull their hair out that Spotlight didn’t come forward with their evidence sooner…but to jump the gun before all the facts had been hammered out would have left them open to doubt when there was little to be had. They put their careers on the line to tell this story the right way and in doing so they likely saved lives. Singling out any one person doesn’t feel fair because Spotlight is the very definition of an ensemble film. McCarthy has cast his movie well starting with Michael Keaton (RoboCop) as the team lead that ultimately makes the call when they bring their findings forward. Mark Ruffalo (Thanks for Sharing) is the impassioned champion of the down-trodden that wants to push forward even though his journalistic side tells him Keaton’s path is the right one. Rachel McAdams (The Vow) underplays her role so much that the actress basically disappears inside herself while Liev Schrieber (Fading Gigolo) crackles as the editor-in-chief that prods Spotlight to keep going. The film isn’t flashy or overly sentimental so as a whole it’s not as ingrained in my memory like other films I’ve seen in 2015. It does have several moments, though, that are hauntingly present when anyone brings up the film. It’s easy to see why it’s been heralded as one of the best films of 2015, it’s old-fashioned in construct and forward thinking it its execution. 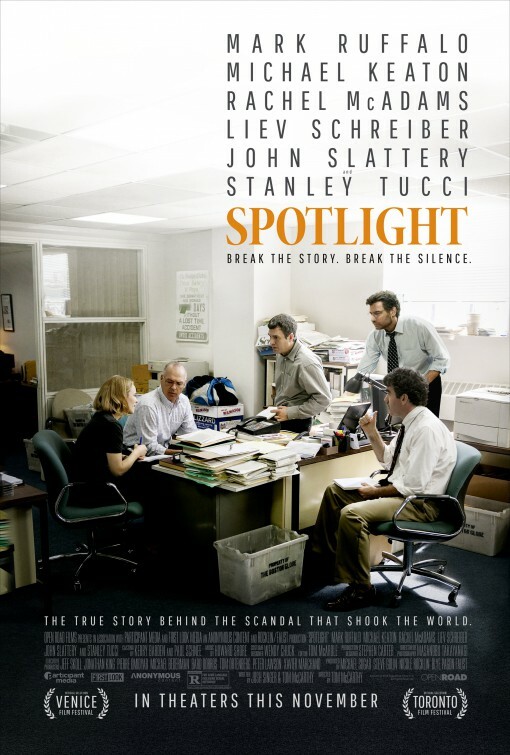 Thoughts: A drama that looks to be along the lines of All The President’s Men, Spotlight is a glimpse into the investigation by the Boston Globe that wound up exposing a now-famous cover-up of sexual abuse within the Catholic Church. This material could have been delivered in any number of cinematic ways and has been covered in one way or another in documentaries already…but director Tom McCarthy has assembled some top-tier talent for this dramatization. Oscar nominees Michael Keaton (Minions), Mark Ruffalo (Thanks for Sharing), and Stanley Tucci (Jack the Giant Slayer) join Rachel McAdams (The Vow) and Liev Schreiber (Fading Gigolo) as journalists seeking to uncover the truth and dealing with the landslide of backlash. It’s an important story to tell and I’m hoping that the roster of stars on board bodes well for its overall success. Review: Much to my number-minded mom’s chagrin, I was never the math whiz she wanted me to be. With a flick as by the numbers as Million Dollar Arm is I can, however, spot a movie formula without the use of a graphing calculator. It’s a simple equation, really, made simpler by a hokey screenplay courtesy of Tom McCarthy and pedestrian direction from Craig Gillespie. You ready? 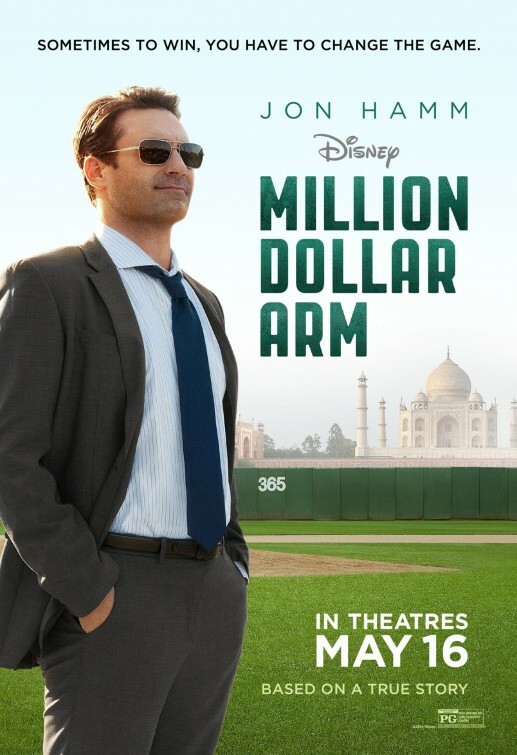 Here’s the thing: I actually think there’s a respectable movie to be made out of the story of an arrogant sports agent (Hamm, ) scraping the bottom of the financial barrel who strikes a deal with the baseball league to sponsor a contest to find the first Indian baseball player. The problem is that Walt Disney Studios, McCarthy, and Gillespie all made the movie from the wrong perspective. If you see the movie (as a rental, por favor) you’ll understand that it’s the two young men and their baseball loving translator that are the heart of the picture and anything/everything related to Hamm’s agent character drags the film to TV movie of the week levels. Though he’s popped up in ok supporting roles over the past few years, Hamm sadly doesn’t have the chops that make the type of leading man this type of film needed. Better suited for a Dennis Quaid, Ben Affleck, or shoot, even Casey Affleck, Hamm struggles with Don Draper-izing his small screen handsome features and wardrobe. Taking a page from Jerry Maguire, he can’t even do what Tom Cruise accomplished in that film and make his character likable…even when he’s speaking lines that should do the trick. It’s puzzling that the film so desperately tries to avoid telling the story at the center of it all with way too much of the way too long 124 minute running length devoted to Hamm’s gradual realization that the woman renting his guest house (Lake Bell, who knows she and Hamm are mismatched) is girlfriend material. Bell, Bill Paxton (Indian Summer), and Alan Arkin (The Incredible Burt Wonderstone, who literally sleeps his way the film) do their best to counterbalance the enormous anchor Hamm ties to the film but can’t keep it afloat. As the fish out of water baseball hopefuls, Suraj Sharma (Life of Pi) and Madhur Mittal (Slumdog Millionaire) are winning presences and do much of their own impressive pitching. However, the one person that manages a home run if not an outright grand slam is Bollywood star Pitobash making his Hollywood debut. At first I wrote the tiny bundle of energy off as simply comic relief but as the film went on I wanted to see more of him. To say that he makes a great save in the final inning is to put it mildly as in one short speech he nearly makes up for all the hooey that came before. It’s in this moment that you might, like me, realize how much better a movie was waiting to be made had Disney recognized where the true focus should have been. 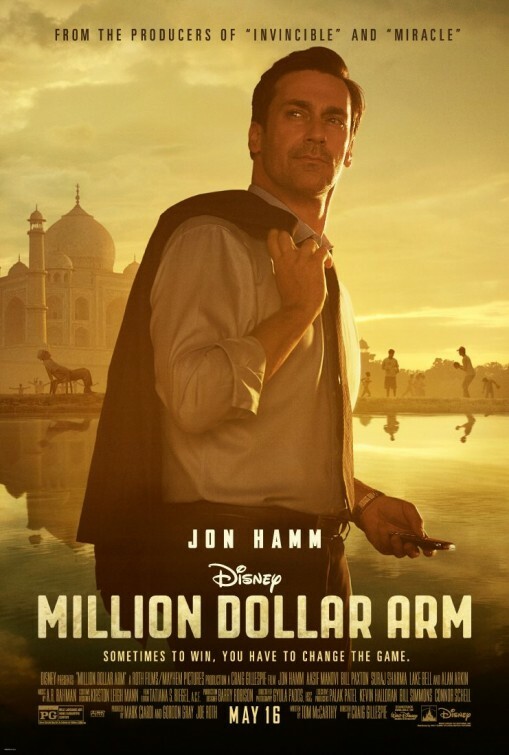 Reminding me a lot of Disney’s 90s offering Cool Runnings, Million Dollar Arm can’t complete in the big leagues of other sports related family entertainment (rated PG, parents should know this really skates the edge of PG-13 material) due to Hamm’s not ready for primetime performance and a lack of faith in the material. Instead, take a peek at The Rookie, Disney’s 2002 baseball-makes-grown-men-cry offering.